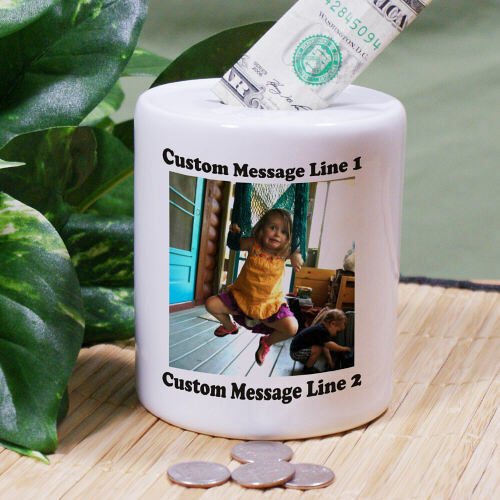 Nothing gives your youngster more gratification than adding their allowance to their coin bank, and when you give this personalized photo gift to them, they'll be ready to use it! Not only will they have their very own bank for saving their pennies, but it'll come with a favorite photo memory on it, so they can cherish it for years to come. Your Personalized Coin Bank measures 3 3/4"h x 3"w and contains a large slot for coins and large bills. Free personalization of any photo upload, two line custom message and text color is included. Just simply upload any digital photo below. For production purposes, please enter a brief description that best describes your photo. Additional Details This is one personalized gift that your kids can use and cherish for years to come! They'll love saving up their allowance in this personalized bank made just for them. Our Picture Perfect Photo Jigsaw Puzzle would be another great gift that your kids can play with.